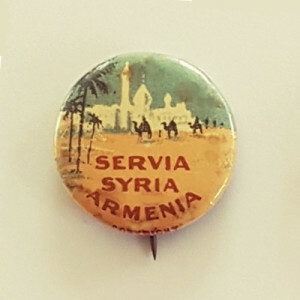 Australian WWI Fundraising Badges - "Servia Syria Armenia"
Written by N. Pezikian — July 1 2016. 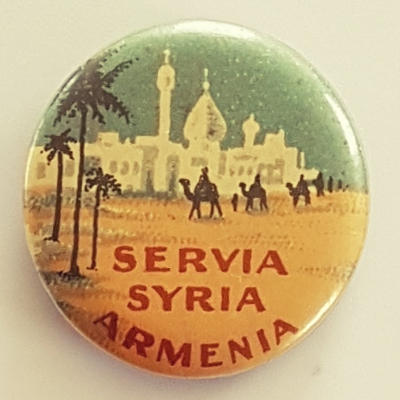 In January 2015, on the eve of the centenary of the Armenian Genocide, I stumbled on eBay a tin badge inscribed “Servia Syria Armenia”. This chance discovery led me to write an article on this badge at the time of the centenary commemorations. 1 Since then I have been encouraged to write another, more detailed article. My research reveals interesting aspects about the circumstances in Melbourne, Australia at the time and expands our knowledge on this fascinating badge. Badges like these also referred to as “tinnies”, pins or pin-backs and were commonly referred to as buttons and were issued across Australia since 1915 to help raise funds on “button days” organized by the Commonwealth Button Fund (CBF). 2 To trace the story on how this badge came to light we need to firstly understand the circumstances prevailing at the time and specifically the fate of the Armenian people. With all the lobbying and fervour the Lord Mayor of Melbourne in response to the VFA appeal took up the initiative by convening a meeting of the Council of Churches of Victoria in the Town Hall where it was agreed to designate 22 April 1917 as ”Armenia Sunday”. 7 With the success of the “Armenia Sunday” and to maintain public interest the VFA sought permission to the State War Council (SWC) to hold a button day. 8, 9 During this time in addition to the plight of the Armenians the Australian public were similarly made aware of the fate of the Serbian and Syrian nations. We are fortunate that the Suffering Nations button day was well documented across the Melbourne newspapers providing us a good insight on the day’s proceedings and vital information on the “Suffering Nations” badges. Surprisingly, there were indeed four different badges in two separate designs. 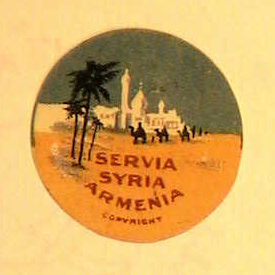 The first design with the words “Servia Syria Armenia” showing camels crossing the desert with Eastern buildings in the background was registered for artistic copyright by Mrs Frances Woolcott, honourable organiser of the CBF, on 29 November 1917 with the Attorney General’s Department, Copyright Office. 13 (Image 1). This design was used on the round buttons which came in 22mm and 32mm sizes. The word “Copyright” was inscribed on the bottom edge of the small badge only. These two badges were sold for 1/- (one shilling) and 2/6 (two shillings and sixpence) respectively according to size. 14,15,16 (Image 2 & 3). 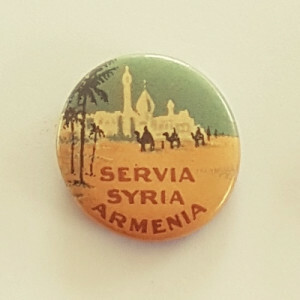 There are two types of the small round tin badge “Servia Syria Armenia” in existence. One theory is that the less common open-back variety was made to replenish stocks especially given the “Suffering Nations” appeal lasted several weeks across regional Victoria. 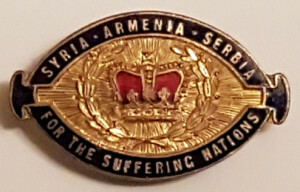 (Image 4) The image portrayed on the round badge is a mystery as there was no depiction of the anguish and horror of the region at the time instead perhaps the designer deliberately wanted to portray a scene of tranquillity and peace rather than the sad truth. 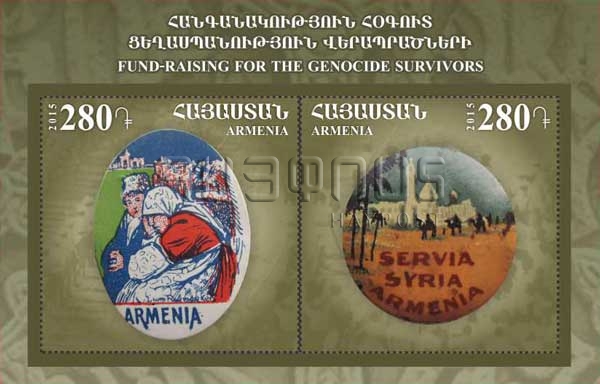 Amazingly, after my article in April 2015, the badge again was brought back to life in December 2015 when Armenia issued a souvenir stamp sheet depicting the “Suffering Nations” small round badge following the recommendation from Mr Hayk Demoyan, Director of Armenian Genocide Museum & Institute in Yerevan, Armenia and member of the Board which decides on annual releases of Armenian stamps. (Image 8). For collectors and historians, this paper has revealed that there were four badges in two distinct designs issued on 7 December 1917 on “Suffering Nations Button Day”. There is some conjecture amongst collectors that the oval metal badges originated from England. This is a misconception as the crown on the badge represents the State of Victoria and not England. In terms of rarity, the closed-back variety of the small round badge is the most common and often sighted on eBay, all the other varieties are very rare. Today, after almost 100 years these surviving badges issued on “Suffering Nations Button Day” on December 7 1917 are not only evidence of the huge groundswell of public support and financial assistance but also testimony to the truth and reality of the Armenian Genocide. 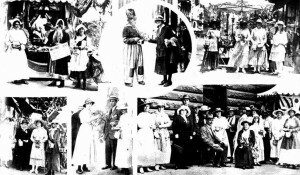 The in-depth history of the Armenian Relief efforts in Australia has recently been written by Vicken Babkenian and Peter Stanley in their ground-breaking book titled “Armenia Australia & The Great War” of which many of these developments are outlined in detail. Moreover there are over 20 known badges issued by the Allied countries across the world reflecting similar fundraising efforts for the relief of the Armenian people and how badges like these were important to raise public awareness and to provide financial assistance to the suffering peoples of WWI. 1. 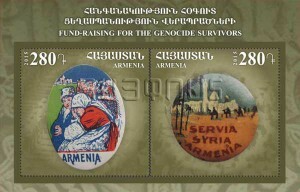 ARMENIAN GENOCIDE CENTENARY. (2015, April) (Sydney, NSW); (2015, March Issue 71). Armenian Philatelic Association (USA), p.15; KEGHART.COM. (2015, April); USA ARMENIAN LIFE. 2. BELGIAN BUTTON SCHEME. (1915, May 5). The Age (Melbourne, Vic. ), p.10. 3. THE ARMENIAN REMNANT. (1917, Mar. 15). The Age (Melbourne, Vic. ), p.4. 4. ARMENIA’S MARTYRDOM. (1915, Dec. 9). The Argus (Melbourne, Vic. ), p.5. 5. HELP FOR ARMENIA. (1917, Dec. 5).The Age (Melbourne, Vic. ), p. 9. 6. GENERAL NEWS. (1917, Mar. 14). The Age (Melbourne, Vic. ), p.10. 7. ARMENIA SUNDAY. (1917, Apr. 21). The Argus (Melbourne, Vic. ), p.16. 8. ITEMS OF INTEREST. (1917, Mar. 14).The Argus (Melbourne, Vic. ), p.8. 9. IN BROKEN HILL. (1917, Aug. 15).Barrier Miner (Broken Hill, NSW), p.6. 10. NEXT BUTTON DAY DECEMBER 7. (1917, Oct. 16). The Argus (Melbourne, Vic. ), p.4. 11. WAR FUNDS BOARD. (1917, Nov.17). Geelong Advertiser (Vic. ), p.2. 12. THE SUFFERING NATIONS. (1917, Nov. 30). The Argus (Melbourne, Vic. ), p.6. 14. NEXT BUTTON DAY. (1917, Nov. 22).The Argus (Melbourne, Vic. ), p.6. 16. LAST BUTTON DAY OF 1917. (1917, Dec. 8). Leader (Melbourne, Vic. ), p.45. 17. SUFFERING NATIONS’ DAY. (1917, Dec. 15). The Australasian (Melbourne, Vic. ), p.54. 18. MELBOURNE BUTTON DAY. (1917, Dec. 8). The Ballarat Star (Vic. ), p6. 19. BUTTON DAY. (1917, Dec. 8). The Age (Melbourne, Vic. ), p.13. 20. FOR SUFFERING NATIONS. (1917, Dec. 6). The Argus (Melbourne, Vic. ), p.6. 21. SUFFERING ARMENIA. (1918, Feb. 2). The Age (Melbourne, Vic. ), p.10. 23. NEWS OF THE DAY. (1918, Apr. 22). The Age (Melbourne, Vic. ), p. 5. 1. Original design of the round badge, courtesy National Archives of Australia, NAA: Series A1861, No.3905 p.3. 7. For the “Suffering Nations” (1917, Dec. 15). Weekly Times (Melbourne, Vic. ), 27. 8. Centennial of the Armenian Genocide. Orders and Medals (Orders) Haypost. Stamps. 2015. Nick Pezikian started collecting at an early age. Like most young boys his age he started with collecting stamps until his early teens. His interest in stamps was reawakened when he discovered Armenia issued postage stamps during the brief period of independence from 1918 till 1923 when the country was absorbed by the U.S.S.R. This discovery led him to actively collect the imperial stamps of Armenia. During this time he wrote several articles in philatelic and community publications both in Australia and overseas, culminating in “The Bibliography of Armenian Philatelic Literature” which details over 400 citations on Armenian stamps. Victory Badges was established in 2005 as a niche on-line shop for the collector of pins and badges. As a collector himself, Nick understands what a collector needs and has developed a good network of loyal customers. Currently Victory Badges has over 2000 products in stock ranging from vintage, rare items to modern collectible badges. In early 2015 he saw a WWI badge being sold on eBay which had the word “Armenia” inscribed on it. To his amazement he found out the badge was issued as part of the Armenian Relief efforts in Australia almost 100 years ago. This chance discovery led him to write an article in the Armenian Genocide Centenary commemorative book released in Sydney, Australia. Since then he has recently published a more detailed and thorough analysis titled Australian WWI Fundraising Badges – “Servia Syria Armenia” which finally resolves the mystery of the badge. 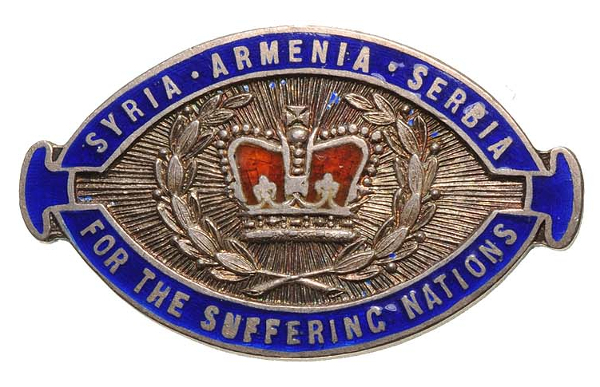 This single badge has further inspired the author to start collecting and cataloguing Armenian Relief pins and badges issued from all over the world during WWI resulting in the forthcoming publication of The Catalogue of Armenian Relief Pins & Badges. Nick is seeking to connect with other collectors to continually expand and improve the limited knowledge we have with these small collectible items. These badges need to be preserved and cherished by future generations as they provide tangible evidence to the relief efforts undertaken by the Allied countries during WWI and are a testimony to the truth of Armenian Genocide. His mission is to properly record these items and to continually update the catalogue with new badges and findings. Many of these pins and badges are extremely rare and information on them is even more difficult to ascertain so any assistance from collectors, historians or researchers is always welcome.